Extra Child: (Between 07yrs to 12yrs) 20% of the Package rate. 03 Nights accommodation in well appointed Centrally air-conditioned rooms with Satellite Connection LCD TV, DVD Player, Mini Bar, and Electronic Safe & Telephone. Airport /Nearest Railway Station Transfers by sharing A.C Coach. (INR 350/- extra from Madgaon Railway Station) Welcome drink on Arrival (Non-Alcoholic). 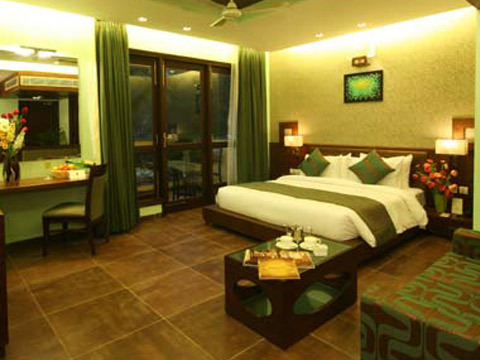 20% discount on Ayurvedic Spa. Check-in Time 13:00 Noon & Check-out Time 11.00 A.M. 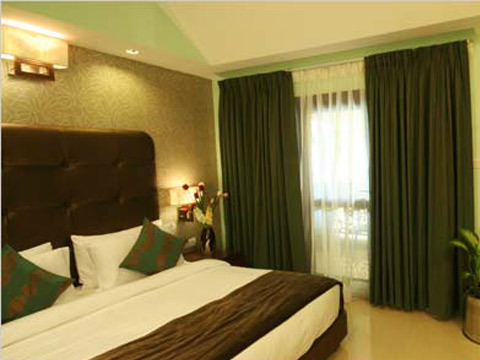 Premiere Suites are only three in number & these suites are fascinating ones with two private balconies having dual view. These are the specially designed suites that keep & evoke the charm & enthusiasm of a holiday maker/ fun lover throughout their stay. The designer furniture, a soothing relaxing ambience & décor of bedroom supported by upholstery & tapestry is unmatched and adds a modern era character to it .The Bathrooms with rain showers and bathtubs enhance the character of the suites. 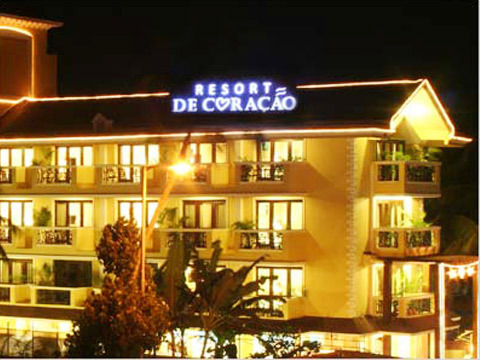 Resort De Coracao, with Four Star Facilities, welcome all Leisure Tourists, Fun Lovers, Honeymoon Couples & Corporates, to a new destination of Hospitality, straight from our Heart, in GOA, the land of Beaches, Churches, Temples, Forts, Goa Luxury Resorts, Goa 4 Star Resort, Multi Cuisine Restaurant Goa, Air Conditioned Luxurious Room, Caves & Sanctuaries, filled with fun & frolic. We are located at Calangute – Candolim Main Road, just 500 meters & a 05 minutes walk from the Princess of Beaches "Calangute” & close to the famous Candolim & Baga Beaches" too. A traditional warm Indian hospitality, contemporary design with modern touch, comfort & convenience and a state of the art spacious Guest Rooms & unmatched services from our experienced, professional & friendly team members, is our asset. The 45 Air Conditioned Luxurious & Spacious Suites, Super Deluxe Rooms, Deluxe Rooms with attached bath, elegant décor & ambience meet all the needs & expectations of all our guests. We have 4 Star facilities in our Resort with rooms having spacious private balconies over looking the swimming pool, Main Road & Chapel. All rooms are well equipped with Centralized Air conditioning system, Smart Card Door Locking System, King Size bed with pocketed spring mattresses, Electronic Safe / Lockers, Tea-Coffee maker/kettle, 24 hrs. Hot & Cold water, beautifully designed bathrooms with bath tubs, rain showers, wall mounted satellite cable TV, Mini Bar, WI-Fi Internet Connection & many more amenities. 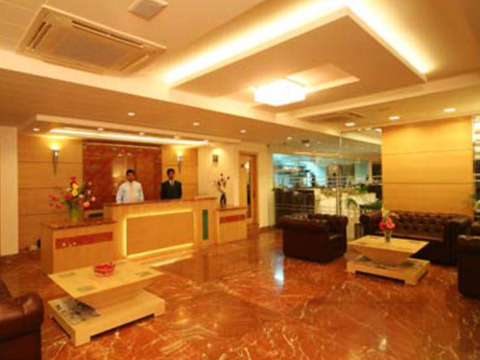 We boast of a Multi Cuisine Restaurant “Ice & Spice” with a Display Kitchen, 24 x 7 Room Service, "Waves" The Conference Hall with video conferencing facility, Pool Bar with Bar-be-que, Swimming pool, Fitness Center, Steam bath, Jacuzzi, specially designed In house games section, Travel Desk, Doctor on call, Car Parking, Laundry, etc. 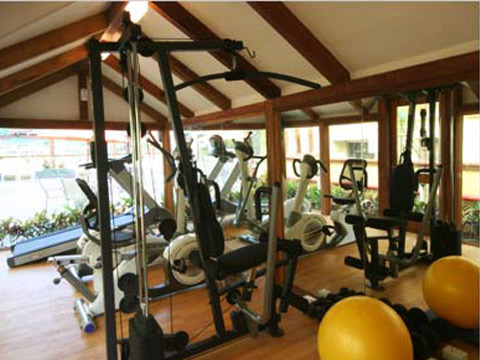 Resort De Coração, with Four Star Facilities, welcome all Leisure Tourists, Fun Lovers, Honeymoon Couples & Corporates, to a new destination of Hospitality, straight from our Heart, in GOA, the land of Beaches, Churches, Temples, Forts, Goa Luxury Resorts, Goa 4 Star Resort, Multi Cuisine Restaurant Goa, Air Conditioned Luxurious Room, Caves & Sanctuaries, filled with fun & frolic. We are located at Calangute – Candolim Main Road, just 500 meters & a 05 minutes walk from the Princess of Beaches "Calangute” & close to the famous Candolim & Baga Beaches" too. A traditional warm Indian hospitality, contemporary design with modern touch, comfort & convenience and a state of the art spacious Guest Rooms & unmatched services from our experienced, professional & friendly team members, is our asset. The 45 Air Conditioned Luxurious & Spacious Suites, Super Deluxe Rooms, Deluxe Rooms with attached bath, elegant décor & ambience meet all the needs & expectations of all our guests. We have 4 Star facilities in our Resort with rooms having spacious private balconies over looking the swimming pool, Main Road & Chapel. All rooms are well equipped with Centralized Air conditioning system, Smart Card Door Locking System, King Size bed with pocketed spring mattresses, Electronic Safe / Lockers, Tea-Coffee maker/kettle, 24 hrs. Hot & Cold water, beautifully designed bathrooms with bath tubs, rain showers, wall mounted satellite cable TV, Mini Bar, WI-Fi Internet Connection & many more amenities. 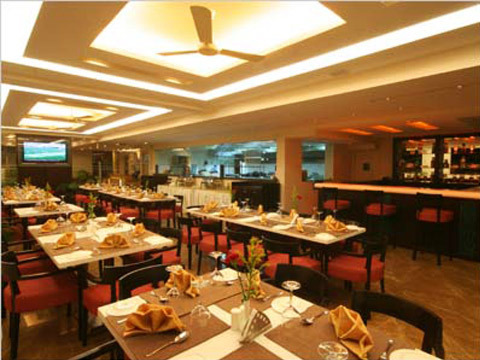 We boast of a Multi Cuisine Restaurant “Ice & Spice” with a Display Kitchen, 24 x 7 Room Service, "Waves" The Conference Hall with video conferencing facility, Pool Bar with Bar-be-que, Swimming pool, Fitness Center, Steam bath, Jacuzzi, specially designed In house games section, Travel Desk, Doctor on call, Car Parking, Laundry, etc.